If you are willing to let him go I am anxious to get my son as my orderly officer. I understand it will be necessary for him to sign the enclosed application applying for transfer and for you to approve of same. It can be at once completed. 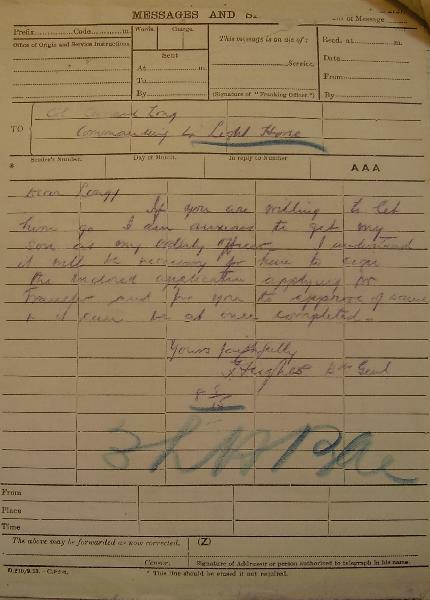 Possibly one of the most craven and disgraceful actions of Colonel Hughes was to use his influence to get his son, Lt Arthur Godfrey Hughes, transferred from the 4th LHR to the 3rd LHB HQ so that he could be safe as Orderly Officer. Hughes had just sent over 300 other sons to their futile deaths at the Nek and consigned a similar number to hospital as being maimed and injured with hideous wounds and now a day after the slaughter, he wants to preserve the life of his own son. While the father may have been motivated by a parental desire to protect his child from harm, and so understandable, in the context of the slaughter at the Nek, it was an abuse of influence that indicates the lack of care the man had for the men under his command. It is unconscionable behaviour and worthy of utmost scorn. In contrast, the son was an honourable man, possibly embarrassed by this turn of events. Once Colonel Hughes was invalided to Australia, the son was seconded to the 10th LHR where he served with distinction. His record indicates that he was an excellent officer with exceptional skills and leadership ability. Fearlessly, he led his men during the abortive Second Battle of Gaza where he was wounded at Atawineh Ridge on 19 April 1917. In recognition of his abilities, he went to Scout School at El Arish in March 1918. this was a distinction few ever achieved. During the Second Es Salt Raid 30 April - 3 May 1918, Hughes played an important role assisting Lt Rickaby in scouting duties. Finally, during the Great Ride, 19 September to 3 October 1918, along with Lt Foulkes-Taylor, led the 3rd Light Horse Brigade Scouts. It is a credit to the man that Lt Arthur Godfrey Hughes was a different man to his father. He served his Regiment with great honour.